Well it has been three weeks now since I left work and I have been taking the time to relax and recover before I get stuck into my creative projects. As indicated by the tarot card that I selected for this month's reading, this is not a time for action, but a time to drift, to dream, to vision and to remember. This period of recuperation has been a time for me to meditate and welcome the inner stillness, so I that I can feed my spirit. Samhain now heralds the coming of the darkness and I welcome this opportunity for a new start as I incubate and strengthen my hopes for this change of life. Interestingly, the coming of the darkness coincides with Neptune's transit in Pisces. The Lord of the Sea can now take us deeper into our imagination. How many times this month have you experienced your dream state in such detail or found yourself lost in a wonderful dream-like state while listening to a piece of music or watching a film that you love? Our dream states can be portals through which we find meaning and colour in our life. Neptune can be a bridge into the mysterious and we can use this opportunity during Samhain when the veil between the worlds is thin, to access the other worlds and tap into the collective unconsciousness. On the night of our Mabon ritual we gathered to thank the God and the Goddess for their generosity and to reflect on the gifts of food that will sustain us over the colder months. The altar was richly decorated with autumn leaves, vegetables and fruits, all reflecting the seasonal change, and emphasising the intensity of the colours which range from lush green, to orange and yellow, and brown. With three rings of the bell the circle was cast and the dragons called. Once the quarters were opened the sacred space was then imbued with a sense of the element of water. With all hands joined we were reminded that this was the time of equal balance between night and day and that all things born will eventually die only to be born again. Since death is inevitable, we should greet death as a friend, who will eventually send us back to the care of the goddess. Each person then shared a cup of apple wine to give thanks for a joyful harvest. A meditation followed to reflect on our bounty and to remember those less fortunate than ourselves. Healing was then sent to the victims of the recent earthquake in Japan and also to mother earth and ourselves. At the conclusion of the meditation, we were given an opportunity to share our experiences and then we thanked the Gods for their insights, we closed the circle with three rings of the bell and the residual energy was then grounded back into the earth and forwarded to individuals for healing. More information regarding this circle and past circles can be found in our Book Of Shadows. 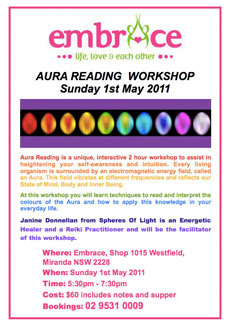 Our next Full Moon Circle will be held near Engadine on Friday May 13, 2011. Please contact us for further details if you would like to attend. Cold grey clouds begin to cloak the planet. The temperature falls as the heat fades. Trees, once majestic in their green foliage; now are shedding their summer growth and the leaves turn yellow, gold and brown as they die off. The Green Man has passed this way and moved on in his eternal cycle. 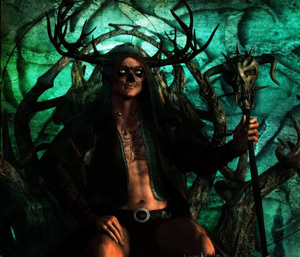 The Horned God, protector of the animals and guardian of the deep woods is summoned below to take up his duties as The King of the Underworld. With the Autumn and Winter upon the world, The Horned God fulfils his duties as the ruler of the spirit world. Not the cruel devil portrayed in fiction and Christian Doctrine, The Horned God is still serves as protector and guardian. It is He who opens the door between this world and the afterlife at Samhain and as protector, gives the Goddess safe passage through the underworld that facilitates her rebirth as the Maiden in the Spring. Looking about us at this time of year it is easy to see how the influence of the Gods affects the world. They are directly connected to the seasons and the flow of life about us. We are apart of this and affected by it. We might shut out the cold and turn on lights to push back the dark but we can not escape the fact that The Horned God has left the world above and that the Goddess grieves for him. While Mabon is a time for giving thanks for what we have and the people in our lives, Samhain is the time to honour those who have gone before us. In the Northern Hemisphere this time is celebrated in the world. All Hallows Eve or Halloween in October. The Day of the Dead or Dia de los Muertos held in November or the Obon Festival in Japan in July. Some of the festivals are single day events, others run for two or three days. In most cases this is the time to visit with our ancestors. To either invite them back into our homes or to visit their graves and feast with them. Often gifts and offerings are made to the spirits in the hope for a prosperous year and to encourage their blessings. Sometimes the belief is that if they do not honour their ancestors, they will become angry and either curse or haunt the offending descendant. For most Pagans this is a time of celebration and communion with the past and a time to remember those who have gone before us. We embrace our past and the wisdom of those who now reside in the spirit world and we give thanks to The Horned God for allowing us to share this celebration with those he now protects. The most simple ways to celebrate this time of year are to visit your family and friends who have past and say a prayer for them. To bid them peace and to seek they continued support and guidance. Alternatively set a place at your table with your evening meal for those who wish to attend to join you. Again, say a prayer wishing them peace. Invite them to join you and then bid them return to the Spirit World when the meal is done. Your Altar too can be a place of remembrance with images or symbols of those passed away placed on the Altar as you celebrate Samhain and the love of The Horned God, Guardian of the Underworld. The path of the Goddess Hecate is a path of the heart. She is Hecate the maiden, Hecate the mother and Hecate the crone. She is a triple goddess in her own right. Unlike the detached meditations of the East, or the sedate Sunday prayer meetings of the church, witchcraft ceremony is passionate. The more deeply we feel about the Goddess when we pray to Her, the more moved we are by the liturgy, the more powerful the experience. There is a place of truth and love that reaches the heart. Devotion is a supremely personal matter, found by each of us in our own hearts. The more you learn about the Goddess, the firmer your faith will become. Learning to see the Goddess in all things is part of it, too. See Her when you slice an apple across, sit under a tree, or watch a moonrise. See Her when you perform simple tasks, such as sweeping, and recall the symbolism of brooms. A Goddess view of cooking turns a pot into a cauldron of transformation, gardening into goddesshood, singing into sorcery. 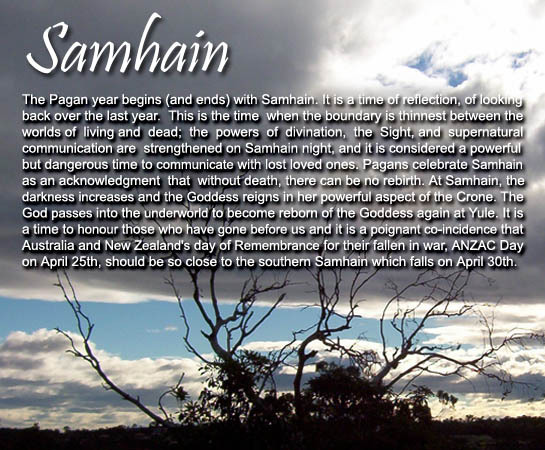 Samhain marks the Celtic New Year and the beginning of the dark half of the year. The veils between the worlds are the thinnest at this time of year making it an excellent time to communicate with our ancestors. However, most people consider contacting the dead a risky proposition especially if one is not conversant with the correct protocols of divination. Communicating with the dead is essentially one of the oldest religious practices. From the earliest stages of civilization, people have used various means of divination to communicate with the ancestors and other supernatural beings when seeking guidance. It is one of the primary practices used by shamans, seers, priests, medicine men, sorcerers, and witches. Such persons were called diviners, and they often belonged to special classes of priests and priestesses who were trained in the practice and interpretation of their divinatory skills. The ancient Greeks had their oracles who spoke for the gods and as far back as 1000 BC the Chinese had "I CHING". During the Dark Ages, divining arts went underground, but after the Crusades they were followed more openly and soothsaying became popular which included such acts as necromancy, pouring oil into a basin of water to observe the formation of bubbles, scrying in water and in mirrors, shooting arrows, casting lots, and numerous other acts. The latter part of the nineteenth century witnessed a revival in divination, especially in the United States and England, with such practices as spiritualism, tarot readings, séances, crystal ball scrying and other types of divination becoming widely popular. The concept of conducting rituals to honour the dead is still being performed on Samhain night, and divination will at times be incorporated in the proceedings. The divination may include scrying into a fire, a glass, or a dark bowl or even guided meditation for the purpose of past-life regression or seeing into the future. 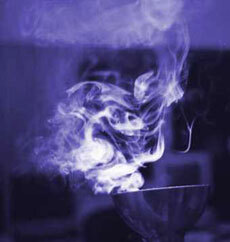 Cast a circle of protection, and light a purple candle and place it on your altar or light a fire in your cauldron. You could even throw in some mugwort to assist you moving your consciousness through the veil. Sit silently and breathe deeply, allowing your conscious mind to grow quiet. Gaze at the flame and permit your thoughts to drift by without judgment. Soften your focus and relax your vision. Concentrate only on the flame. Ask a question. Observe the flame expectantly, and open your observations to your intuition. Invite the flame to impart images. Write down your insights, and carefully date your interpretation for future reference. 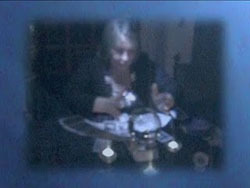 Coming from a family of psychics I have gained exposure to some interesting psychic experiences over the years. My Grandfather on my mother's side was a Spiritualist and a brilliant psychic who gave 'overhead' readings at his local church. The term 'overhead' is similar in nature to that of 'cold calling'. 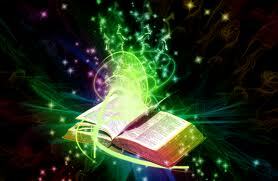 That is, you are accessing information from spirits you may not have established a working relationship with. Over many years my Grandfather spoke of his incredible spiritual experiences and he has given me a wonderful gift of understanding and an in-depth knowledge of spiritual and paranormal activity. My father's family also dabbled with the spiritual realms but their approach was contacting spirits via séances and the Ouija board. I can certainly testify to some scary and hair raising situations during those times which has made me very wary of this method of contacting spirit. I noticed in one of the paranormal programs shown on television recently that they have been using the Ouija as a tool in ghost hunting, with very little explanation on its hidden dangers and the proper way in which it should be used. Strangely the Ouija given its dangerous qualities is sold as a toy in toy and game shops. In general, professional mediums and psychics tend to frown on the use of the Ouija, regarding them as a system that can easily be controlled by low astral beings which are probably intent on something other than providing accurate information. The Ouija Board is an ancient instrument used for divining information from disembodied spirits. Precursors to the Ouija date back to ancient times. Before the birth of Confucius, around 551 B.C., similar devices were used to communicate with the dead. In Greece, during the time of Pythagoras, 540 B.C., a table with various points and symbols on wheels was used for divination. The rolling table was used through the nineteenth century. Ancient Romans used similar devices as early as the third century A.D., and in the thirteenth century by the Mongols. Some Native Americans used a "squdilate board" for the purposes of locating missing objects and people and to obtain spiritual information. The planchette came into use in 1853 in Europe. Planchette means, "little board" in French. Invention of the device is generally credited to a Spiritualist by the same name, M. Planchette. It consisted of a triangular or heart-shaped platform on three legs, one of which was a pencil. The user, usually a medium, would move the device over paper to draw pictures and spell out messages. Elijah J. Bond invented the Ouija in 1892. He sold his patent to William Field who has been considered the father of the Ouija. Mr. Field founded the Southern Novelty Company in Baltimore, Maryland that later became known as the Talking Board Co., and marketed the Ouija. During the early part of the 20th century the Ouija became extremely popular as many people desperately wanted to communicate with loved ones killed in the war. This was during the revival of spiritualism and many people during that period were conducting séances at social gatherings. From skeptics point of view there can often be a logical and psychological explanation regarding the messages received through the use of the Ouija Board. The skeptic will assumed that these messages do not have any supernatural origin. From a psychological point of view the subconscious mind can use physical responses to reveal information that can be hidden in the sub conscious level of our mind. This is known as an ideomotor response. Ideo motor response is a concept in hypnosis and paranormal research. Based upon the precepts of the words 'ideo' (thought), 'motor' (action or activity) and response (in meaning respondant to stimuli) - the phrase is most commonly used in reference to the psychological activities that result in the muscular reaction, in humans, that may be presented as an abortive motion or even a reflexive reaction. It is strongly associated with the practice of hypnosis, whereby 'yes' or 'no' answers may be given by indication of a physical manifestation rather than a verbal one; such results are produced by 'pre-suggesting' the correct response and attaching ito either the left or right hand side of the subjects body. Examples of this are when using a pendulum to find an answer to a question, the pendulum swings in a particular motion to indicate a yes and no answer. Another technique using the ideomotor response is the healing practice of kinesiology. Muscle testing is done to identify imbalances in the body's structural, chemical, emotional or other energy, in order to establish the body's priority healing needs, and to evaluate energy changes brought about by a broad spectrum of both manual and non-manual therapeutic procedures. The ideomotor reaction in this case is using the muscle monitoring as a feedback system via nerve pathways and the meridian system of the brain and body. Ideodynamic methods of communication or signaling have been used and reported for centuries. Examples abound of the recording of trance work involving mystical visions, spirit writings, 'speaking in tongues' and ecstatic dance and ritual, and these demonstrate an awareness of ideomotor and ideosensory behaviour. Sometimes the Ouija board has been blamed for a variety of irrational human behaviour; however the Ouija board is only an instrument in the process. Acting as a release mechanism the board can enable powerful psychological forces to be unleashed from within the individual. The problem can escalate if the user is emotionally immature, personally insecure, or experiencing psychological trauma. Whether you are a skeptic or a believer when using the Ouija Board one should always proceed with caution and take in consideration the physical and mental conditions of the participants. You certainly would not want to participate if you were physically ill or suffering from depression, schizophrenia or any other psychotic illnesses. Unfortunately, inexperienced people who play with the Ouija do not realize the inherent dangers and they do not realize that they often have no control over who responds when they evoke spirits. Responding entities have been known to lie and deceive by the answers they give, being very convincing by using the name of the one the user intends to contact. When playing with the Ouija you are actually opening a portal, usually to the lower levels of the astral, where negative energies can inhabit. 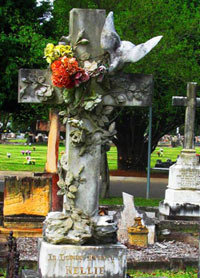 The lower levels of the astral plane (sometimes called the etheric plane) are where we usually find grounded spirits, unevolved spirits, the souls of those who died suddenly or violently, negative entities and, according to some sensitives, the spirits of those whose bodies are being kept alive by artificial means. Experienced people can use the Ouija board as a tool for spiritual information but like any psychic process certain guidelines should always be followed. Always apply a system of protection for opening and closing your Ouija sessions. Make sure your surroundings are comfortable and seemingly free of negative energies. Smudging the surroundings and the participants with sage is an excellent way to get rid of negative energies. Some people like to say a prayer/affirmation over the board - or do a protection ritual. You can also envision a protective white light of energy surrounding yourself, the board, and those you are working with, and even the room. Ask your spirit guide or higher self to protect you and bring you spirits to channel who are on higher frequency in truth and in light. Be sure your board is clean and free of dust. Wipe gently with a clean soft cloth before you begin. You can play music as you will also be focusing on your thoughts as you channel. You can ouija alone or with another person. If you ouija with others be sure they are not negative in their thinking. Determine who wants to use the board - and who wants to just observe. Decide which person will ask the first question - and if there is to be an order to follow for asking questions. If everyone wants a turn at the board it is best to go clockwise around the board with each person taking their turn. The time for each turn will vary with the spirit you have answering. People may be contacted by more than one spirit. Ask for one spirit at a time and always get a name before you begin. Most people will use their dominant hand to work the board, which in most cases is the right hand. You may also discover, as you work with the board, that you can subconsciously control the movement of the indicator - the same as using a pendulum. If you are not sure, close your eyes and allow the indicator to move alone. One of the first questions you might want to ask when you begin to work with your ouija board is the names of your spirit guides. They are the ones who are here to protect and guide you. Everyone has at least one spirit guide. You can start by asking for a message from spirit - or by asking spirit simple Yes or No questions to which you know the answer. Always start with general questions. Save the personal questions for later when you are comfortable with the spirit that you are working with. Stick to subjects with positive energy when you begin to channel through ouija. Once an answer is given you can ask for more information or clarification of the answer. But - you can only ask a question once! Do not continue to ask the question over and over to seek the answer you want. Questions can be about you personally - or universal or about any topic you think the spirit would like to converse about. You may get thought forms and mental images as you talk to the spirit. An experienced person will expect the unexpected. Sometimes apparitions can manifest in the room. Objects may move around, the table might move. Voices may be heard. If spirits ask you to do weird things or a negative entity comes in stop using the board immediately. Ask you guides to remove the negative spirit and make sure you close any portals that you have opened and close the circle down completely. Never ask spirits to do harm to others. Never use the board to control others - or have power over them. Do not let others use your board when you are not using it. Keep the board in a special and safe place. Do not get addicted to the board. I would like to reiterate at this point that the Ouija Board is not a game but a tool to use for psychic/spiritual information. Please use it responsibly and with a positive intent. A shaman is a healer who helps people to understand and respect the natural and the supernatural world around them and within them. A Shaman is the mediator between the material world and the various astral realms and can walk between these realms at will. An important aspect of Shamanism is the tools the shaman uses, these tools are physical representations of the tools that the shaman uses during his or her astral journeys. The tools e.g. the drum or the rattle can assist the shaman in entering an altered state of consciousness. Shamanic tools therefore focus and express energy received from Spirit which can be used for healing, diagnosis, cleansing, journeying and divination. Shamans have always been intermediaries between the worlds and between the body, mind and spirit. Shamans recognize that traumas, illness and crises have a profound effect on our wellbeing and that often when a traumatic event occurs a piece of the soul splinters, leaving the individual feeling not quite there. This separation can open the body to imbalance and illness, which can lead to dysfunction, disorganization and disruption. Sometimes the splintered soul piece/s will return on their own and sometimes assistance is required to reinstate those missing pieces. A Soul Catcher is a device used by a Shaman to retrieve "lost souls" as a cure for some imbalances caused by the soul splintering. Using a special crystal called the Soul Catcher, the shaman journeys through the Underworld seeking the lost soul pieces. Sometimes it can take several journeys to retrieve the lost parts of the soul. The crystal is a carrying case for the soul part from the Otherworld to the material plane. The soul crystal attunes to the individual's energy so that soul fragments can be located and stored during the soul retrieval process. Attuning involves placing the crystal either against the person's heart or third eye chakra. Upon return, the soul re-enters the body through the same chakra as it does during astral projection. 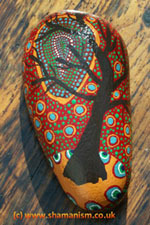 Soul catchers can also be hand painted stones or animal bone and can be hand crafted from wood. 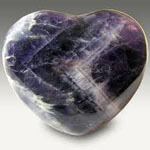 I use a heart shaped Chevron Amethyst for my soul catcher which I find is one of the best stones to work with the Third-Eye or Heart Chakra, enhancing both intuition and physical vision on all planes of existence. Chevron Amethyst also creates a strong healing field around the user, and as such, is a good choice to cleanse the aura and to enhance the immune system. Just recently I visited the TUTANKHAMUN EXHIBITION in Melbourne and found the craftsmanship and the care taken to prolong life was incredible. The Egyptians had a belief that if their name was recorded they would live on for eternity, be it a Pharaoh or the Gods themselves. Something I found interesting was that most of the statues and coffins were carved out of wood, and then covered in a type of gold leaf. The most popular colour seemed to be turquoise; it is a very intense colour. Then at Circle on Friday night we ended up having an impromptu ritual with an Egyptian theme. All things considered it went very well indeed. This year the subject of Egypt seems to come up at least once a week, and today I just picked up a magazine and opened it up to a page and there it was again, this time an article on OSIRIS. Osiris was worshipped in Ancient Egypt from the earliest dynastic times until the latest period. The nature of Osiris underwent many changes, names, titles and attributes. Amongst these changes, Anubis (The Dead) and Sokar, who together with the God Ptah formed the composite God Ptah-Sokar-Asar. Osiris was a minor God and Anubis was well known and was held in high esteem. But Osiris gained greater importance by absorbing all the Gods of the Dead into himself. 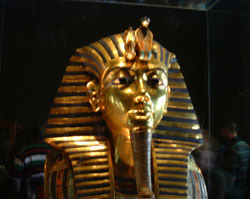 Osiris is mostly shown as green skinned, mummified and wearing the Atef crown, holding the crook and flail. Mythology (not to be confused with history) says he was the first Pharaoh and that he ruled with wisdom and compassion. (Never let the truth stand in the way of a good story). Many Egyptian Gods took on animal attributes. 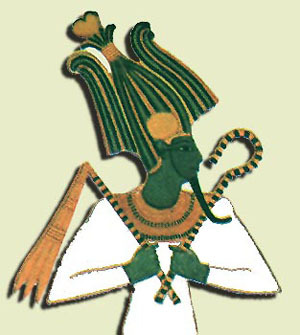 Osiris was depicted as the Bull and the Ram with horizontal horns. Osiris was the eldest son of Nuit, the Goddess of the Heavens and Geb, the God of the Earth. The wife of Osiris is Isis. It was said that they mated while still in the womb. Osiris had a brother Set, God of dissolution. Set was jealous of his brother and killed Osiris and then cut his body into 14 parts and placed them around Egypt. Isis and Anubis went out to find Osiris's body and eventually collected the parts and put them together. Isis then put the breath of life into Osiris and raised him from the dead. From their reunion Isis then gave birth to Horus who avenged his father and returned rule of Egypt to the rightful heir. In death everyone becomes like Osiris with resurrection coming at the end. This original mystery gives us the opportunity to learn how to see with the inner eye, to discover the God within and to once and for all, defeat the false notion of death in the knowledge that we all have an eternal spirit. Welcome to The Book corner! You will find in this section book reviews, new books coming out, interviews with authors and even information about authors signing or talking about their books. If you would like to suggest a book to be reviewed, or even if you want to give us your own review or give us information, please let us know! We will focus on books about Paganism, Witchcraft, Magic, Shamanism, Paranormal Investigations, Earth-based Spirituality, and may also include books on mindfulness, eco-living and others we find interesting. Obviously reviews are based on personal opinion; they are not set on stone and are not meant to be the "ultimate guide". Also please keep in mind I am not a Journalist and do not intend to be one, I am simply a proud Pagan "nerd" who loves her books! Merry meet! There's something about Scott Cunningham, I'm not sure what it is but when I think of him or read his books I have this sense of nostalgia, affection and a strong desire to hug him. Maybe it's admiration for all he did in his life, for the wonderful and powerful books he wrote, or maybe we actually were related in a previous life! However it is, I thought I would write about him today and honour his memory and his work. Scott Cunningham was born in June 27, 1956 in the US and passed away (went to Summerland) in March 28, 1993. His work Wicca: A Guide for the Solitary Practitioner is one of the most successful books on Wicca ever published. There is a bit of controversy around his work, mostly from more traditional Wiccans. He studied creative writing at San Diego State University, where he enrolled in 1978. During this period he had as a roommate magical author Donald Michael Kraig and often socialized with witchcraft author Raymond Buckland, who was also living in San Diego at the time. 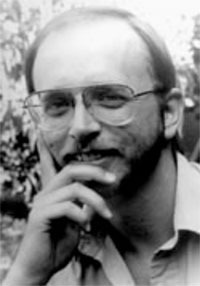 In 1980 Cunningham began initiate training under Raven Grimassi and remained as a first-degree initiate until 1982 when he left the tradition in favor of a self-styled form of Wicca. In 1983, Scott Cunningham was diagnosed with lymphoma, which he successfully battled. In 1990, while on a speaking tour in Massachusetts, he suddenly fell ill and was diagnosed with meningitis. 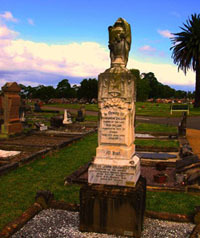 He suffered from several infections and died in March 1993. His books were written in a way that was simple and easy to follow, and at the same time interesting and enlightening, with lots of great advice and information on how to follow your Path. The main points of his work are that religion is deeply personal, and that Wicca is meant to be simple and easy to follow, instead of secretive and highly ritualistic. He said in Wicca: A guide for the solitary practitioner: "Wicca is a joyous religion springing from our kinship with nature. It is a merging with the Goddesses and Gods, the universal energies which create all in existence. It is a personal, positive celebration of life." 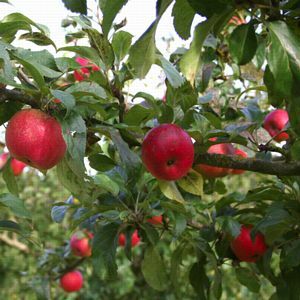 Few of our Mother's gifts are so celebrated in lore as the apple and there are so many deities are associated with apples. When you cut the apple fruit breadth-wise you see the five-pointed star made from the placement of the seed casings. This symbol, the pentagram, is the traditional symbol of knowledge. That the five-pointed star, pentagram, is surrounded by the circular shape of the halved apple, the symbol becomes a pentacle. This is a symbol of protection, the protection of sacred knowledge. 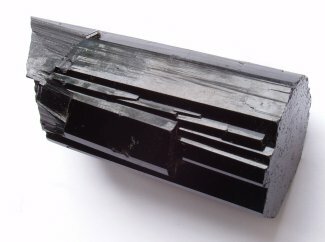 Black tourmaline is known as Schorl and of the Tourmaline group of crystal Black is the most common. It is shiny and opaque identifiable by parallel ridges (striations) which run the length of the crystal. In times past tourmaline was classed as a mineral magnet rather than a gem. The reason for this was its unique electrical energies which cause it, when rubbed or heated, to produce in each of its crystals a positive charge at one end and a negative charge at the other. Tourmaline's unique positive and negative electrical properties gave it its early name of "The mineral magnet". On April 4 2011, the planet Neptune began its journey through Pisces, another symbolic key enhancing the shift in human consciousness slowly unfolding on our planet. Neptune has strong associations with Pisces, both water energy, both belonging to a realm of the mysterious, the inspired and the imagined. Both have no boundaries, build no barriers, escapist and mystical in attitude. Neptune swims quite freely in this watery and boundless sign. We find no wave breakers in Pisces for Neptune as we consider a world letting loose and moving forward with what must be done, changed, seeded, even destroyed as we look optimistically towards the future. During its sojourn in the fixed sign of Aquarius, Neptune has had its bounds, has been far more restricted than is its nature. Every planet has a particular purpose in a sign , each planet spends different times in a sign depending on its orbit. Neptune entered Pisces in April 2011, leave at the beginning of August and returns in early February 2012 where it will stay until 2026. With every passage through a sign a planet is either considered an el supremo guest, a friend, an enemy or a pain in the arse! Neptune moving into Pisces is the el supremo guest as Pisces can and will deliver anything Neptune may demand or ask for. Neptune doesn't ask for the tangible, he doesn't even ask, he sends messages, waves and undercurrents and Pisces responds. Together these two create an overwhelming image, one so full of the imaginative, wild, out of this world, inspired ideas, concepts and passionate actions ever experienced, but also perhaps the most depraved and destructive. The destructive element comes in as Pisces being the last sign of the zodiac, the one concerned with the next cycle, destroys that which is not appropriate for the next wave. Neptune last spent time in a water sign in Scorpio in the 1960's when peace, love, flower power, drugs and open sexuality changed our world and our cultural attitudes. Now just think, Scorpio is a fixed sign and still all this happened, shifted and changed! This also had much to do with the revolutionary presence of a Pluto Uranus conjunction in mid Virgo throughout this time. Despite Virgo's restraint and Scorpio's fixity we still experienced a world in revolutionary fervour. This is mindboggling when we consider the coming planetary line-up. 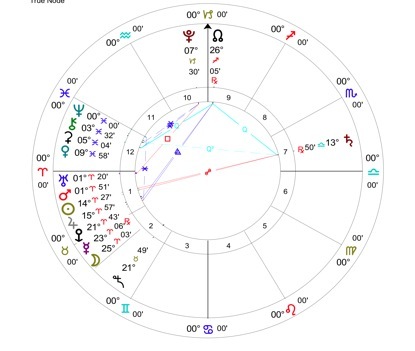 This time we have Neptune in the mutable sign of Pisces, with Uranus in Aries demanding the freedom to express itself, squaring Pluto in Capricorn. The cardinal energy of fire and earth will challenge the world and its governing foundations. Not much restraint with this combination, as Uranus fuels change, Pluto demolishes established rules and Neptune infuses inspiration. These three outer planets all work together to encourage us to construct a new and better world. Pisces imaginatively germinates and nurtures the seeds of the future . With Uranus' sojourn through Pisces in the past seven years we witnessed the churning of the waters and the seeding ideas of what must change. With Uranus in Aries those seeds begin to sprout and some have already done so. Neptune will now connect the fragmented pieces of the Uranian turmoil and weave them magically back together . Germinating the seeds of the future , has much to do with what we allow ourselves to believe and hope for. With this passage we are challenged to trust in a future we can't see but can only imagine. From the personal microcosm to the global macrocosm, these two energies create greater access to highly passionate and emotional experiences and actions, collective inspiration and insightful motivation. 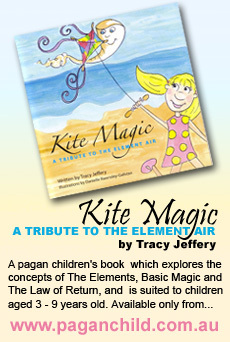 We are also prompted to think of all invisible energies, ephemeral, mysterious and mystical. With this journey the paranormal becomes normal. We step into the oceanic realm of the spiritual and the divine, where the swimmer doesn't follow a particular current, but swims to what feels right, what smells good, what looks the best, senses working overtime for sure. It's interesting to look back previous eras when Neptune journeyed through Pisces to get an idea of what we may expect this time round. What becomes apparent with hindsight is that boundaries were broken, radical ideas were germinated which led to paradigm shifts in human consciousness. These times seemed to add to our understanding of ourselves as part of the world and the greater universe. What spawned during these times had far reaching and long lasting influences that didn't seem to be integrated immediately, but slowly permeated our world view , human psyche, wisdom and knowledge. Many influential philosophies, theories and practices developed about the connection between body, mind and spirit and the power of healing that are still very much part of our world view today and will be added to and developed during this phase of the cycle. - Empedocles writes on the four humours: blood, yellow bile, black bile and phlegm. Later these became associated with the four elements and then the four humours. - Meron establishes the four solstice points. - The Parthenon was built. A 13 metre statue of Zeus was built in Athens. - Zeno of Citium (334 - 262 BCE) a Greek philosopher founded the Stoic School of Philosophy emphasising the goodness and peace of mind gained from living a life of virtue in accordance with nature. - Abd All?h ibn S?n?' (980-1037CE) created the first Pharmocopeia, a great synthesis of practice which included arithmetic, geometry, astronomy, music, earth science, philosophy, metaphysics, psychology, physiology. He was also the first known person to study infectious diseases and the benefits of quarantine. - On May 24, 1032, he observed the earliest recorded transit of Venus. - Copernicus gave his first talk on the sun centred solar system to Pope Clement VII, the idea was spawned. - Magellan's first circumnavigation of the globe was completed in 1522. - Paracelsus (1493 -1541) physician, botanist, alchemist, astrologer - did most of his great work during this time. Pioneering the of use of chemicals and minerals in medicine. He used the 7 metals, 7 known planets associating them with 7 organs known as the Great Idea of Harmony, the macrocosm and the microcosm. - Isaac Newton published Principia in 1687. Newtonian mechanics explained the laws of gravity, laws of motion and the universe as a mechanical machine. Newtonian physics dominated the scientific view of the laws of the Universe for 300 years The idea that God created the universe and left it to work on its own came from Newtonian theory. - The Salem witch hunts and trials. - Darwin published The Origin of Species in 1859 expounding the theory of Evolution. - Marx published The Communist manifesto in 1848. - The first plastic was invented by Alexander Parkes in 1855. - The world's first commercial oil well was drilled in Poland in 1853. - James Clerk Maxwell unified electricity and magnetism into a single theory, classical electromagnetism, thereby showing that light is an electromagnetic wave. - Dr John Snow traces the source of one outbreak of cholera in London to a single water pump, validated his theory that cholera is water-borne thus beginning the study of epidemiology. - The first public exhibition of a Foucault pendulum took place in February 1851 in the Meridian Room of the Paris Observatory. - American Express was founded by Henry Wells & William Fargo. - Solar flares were discovered by Richard Christopher Carrington (1853 -1861). - The Production of steel was revolutionized by the invention of the Bessemer process. - The first commercially successful sewing machine made by Isaac Singer. Most of the above are now fully integrated into our lifestyles and consciousness. Many of the above we can't imagine living without. With this next long transit many of the above are up for review: the theory of evolution, our global economies reliance on oil, the pervasive use of plastic. We must also review our healing techniques and medicines and how the way we perceive our environment impacts on our well-being. 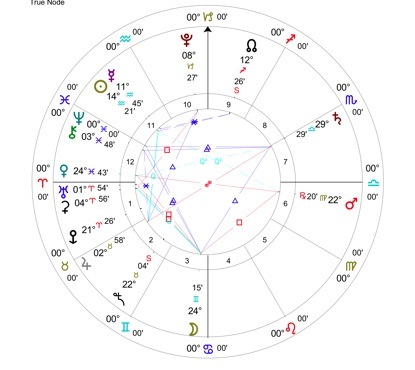 It is crystal clear from the ingress chart above that when Neptune moves into Pisces new beginnings are being channelled. The dominant presence of planets in Aries heralds a new cycle. Uranus and Mars conjunct are the prime motivators leading the way, ahead of the Sun, highlighting an active and restless period ahead, one full of drive and action. There is no stopping us now. The Jupiter Sun alignment heightens and expands this urge, the need for growth and expansion and truth. There is a strong urge for freedom from the constraints of the past. Eris the freedom fighter is prominent with Mercury and the Moon. She is the goddess of discord, awakening us to the world wide mess we have created. Saturn now in the last months of its waxing cycle with Jupiter, opposes Jupiter and the Sun, exposing the great imbalance. Saturn's job at this pivotal point is to discipline us toward balance. A new cycle urges us on regardless and the Saturnian parts of life, attitudes of the past and the authority, will find it difficult to hold on and affirm themselves unless they attune to the developing principles and attitudes of change. A new moon signals the freshness of this time and with a retrograde Mercury closely conjunct we are all very perceptive as the future and past come into light. Mercury and Moon align harmoniously with the karmic Nodes enabling us to make thoughtful change. The seeds of change are being nurtured by Ceres, Venus and Chiron in Pisces. Our past unwillingness to change comes back to haunt us. With Neptune at zero Pisces, we will have a long opposition to the fixed star Regulus. Regulus is moving to 0 Virgo in November 2011 (according to Solar Fire) heralding a shift from a Leo inspired world, based on leaders , kings, gold, the drive to succeed and be known and be better than the rest, full of egocentric attitudes, to a Virgo ruled world, where the sacred, earth, and a service to Gaian principles move us to want to make things work better. This is the new version of the archetypal hero's journey. The new heroes will be those attuned to the service of the Earth and the Sacred and technology will become king. Regulus moving to Virgo is a hugely potent symbol of the great shift in consciousness. With the opposition to Neptune in Pisces we will undoubtedly have a changing of the old guard. Venus is exalted in Pisces, honouring Neptune and encouraging us to move closer to a relationship with grace and the divine. This chart indicates that priorities are shifting. Retrograde Mars opposes Venus suggesting a refocusing and reminding us that directing new energy won't be easy. These twos planetary partners form a T-square with the Moon in Gemini, the rethinking process is complicated. Jupiter in Taurus, a powerful image of nature and resources is opposite Saturn indicating the deliberate steps that must be made for us to move forward with integrity. Mercury is again aligned with the Nodes and this time with the Sun in the rational light of Aquarius. This is indicative of a better attitude about working together. This time Ceres with Uranus at the beginning of Aries, gives great hope in having changed our minds about our neglect of Gaia. She may be retaliating at this stage, with the square to Pluto approaching. Chiron opens doors to the heavenly realm as it nears the conjunction with Formalhaut, the mouth of the fish, wide open inviting us to the unknown. I look forward to the world reshaping itself around us. Ideas, attitudes, trends that spread, take flight, take off, be totally unrestrained - and therefore also potentially super dangerous. In the fashion world - expect, or get creative! Wild shoes and styles never seen before, nor imagined - check out this link. More on fashion in past Neptune era's - here. With Neptune into Pisces we can expect a sensitivity about many things often ignored. Pisces senses and perceives and most of all feels its way. Neptune inspires and together they indicate highly passionate times ahead. There will develop a better sense of how we as a species perceive and sense our environment, a closer connection to all around us will further unfold. What we believe about the future and what's possible is how we can be motivated and drawn to act in this time. It is about survival, saving ourselves from ourselves, the seeds planted now are crucial to our common future. There is a great capacity here for healing, for getting back to nature, the planet and ourselves as we move to a realm of invisible sources and gently ride with an inspired spirit over matter, what really matters, will come to light. Pisces being the 12th sign, and Neptune in the sign of its modern rulership now the outermost major planet since Pluto's demotion, we are at a point of letting go, surrendering, taking off to different waters, deeper and more fulfilling experiences and heightened awareness. With this attitude our understanding of the universal, that which binds us all, oneness, a greater understanding of universal consciousness, its implications and power, will be germinating the vital seed for future development. This all seems wonderfully apt and appropriate for the changes upon us, as quite often said, "The current worldview can no longer sustain us" .The energies of Neptune and Pisces open us to channels, vibes, undercurrents from everywhere and ask us to source a more inspired way of living together on planet earth. Let us have faith as we navigate our Gaian ship through these unchartered waters. "The most beautiful and most profound experience is the sensation of the mystical. It is the sower of all true science. He to whom this emotion is a stranger, who can no longer wonder and stand rapt in awe, is as good as dead. To know that what is impenetrable to us really exists, manifesting itself as the highest wisdom and the most radiant beauty which our dull faculties can comprehend only in their primitive forms - this knowledge, this feeling is at the center of true religiousness." from "The Merging of Spirit and Science"
In addition to our regular Full Moon Circles we also run workshops and classes which are highly interactive and experiential, focusing on participation and engagement of participants. If you want to keep abreast of SOL's circles, gatherings, workshops and activities please click on the banner below to check out our Events Calendar. Crone and Sage is a website that is dedicated to our pagan elders who want to share their knowledge and wisdom, magic and life experiences in the form of articles, poetry, recipes, artwork and music. We would like this website to become a special place where readers of all ages can sit a spell and learn about our elder's talents and knowledge. It would be truly wonderful if this knowledge could be shared with the many generations within our community, just like the ancients have done over the centuries. 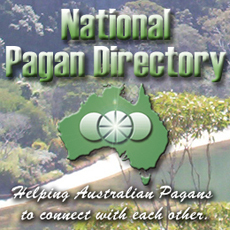 The National Pagan Directory is a Spheres Of Light initiative to help Australian Pagans connect with each other in their local area. 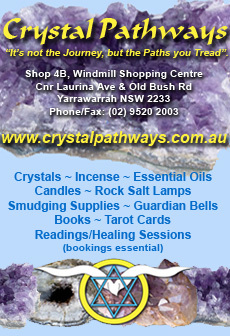 It is a FREE listing & provides links to information about covens, groups, classes, workshops, retreats & other special Pagan events, plus Aussie Pagan businesses & services. 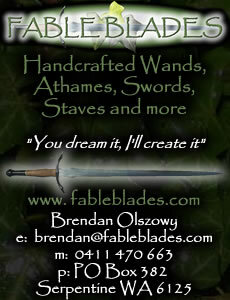 If you would like your coven, group, regular meet-up to be listed in the NPD please send us your details. 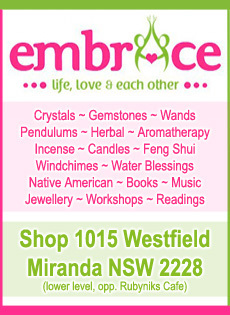 To list your one-off or special events please use our Australian Pagan Events forums. 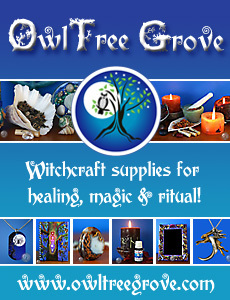 We also invite Celebrants in the Pagan community to promote their services in the NPD. 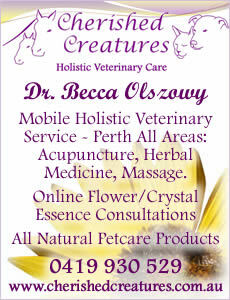 For further information & contact details click on the banner above. Come join us for meditation in the beautiful surrounds of The Royal National Park. Our meditations will be conducted every third Sunday of the month. 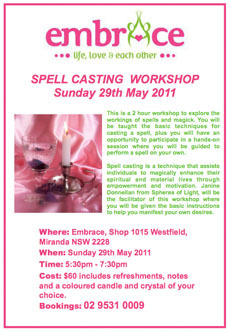 Please email inquiries@spheresoflight.com.au for times and meet up details. Please email us the details of any pagan or community events, classes, workshops or regular meetings that you'd like to see promoted here in this free listing. PAN Inc. full moon ritual. PAN runs a public full moon ritual each month at Rotaract Hill, Seven Hills. Anyone is welcome to attend - the purpose of the ritual is to provide members of the pagan community an opportunity to celebrate the full moon together & network with friends, it is also a public ritual where those new to paganism can attend to learn more and meet like-minded others, and the rituals also help inform the general public about what pagans do and dispel misguided myths about paganism and witchcraft. The circle is held on the top of Rotaract Hill on Terminus Road Seven Hills NSW, just next to the train station. Getting there is easy. If you take the train, the hill is less than five minutes walk (and easily visible from the station). If you drive, there is plenty of parking available both at the base of the hill and across Terminus Road. 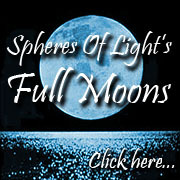 Full Moon info and contact details here. It was believed that the spirits of the departed during Samhain would return to their homes on this night. As a result candles were lit to guide their way and food and drink (including soul cakes) were put out for them. Crush the saffron with a pestle and mortar, add the milk and grind to combine. Sift together the flour and remaining spices into a bowl. In the meantime, cream together the butter and sugar until pale and fluffy. Beat the egg yolks and add to the creamed mixture a little at a time, beating well after each addition. Add the sifted flour and spice mix and stir in the currants. Add the milk and saffron mixture and enough additional milk to form a soft dough. 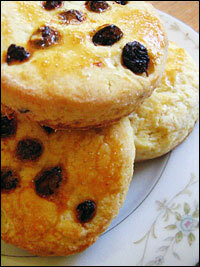 Turn the dough out onto a lightly-floured surface and shape into flat cakes about 5 or 6cm in diameter. Transfer to a well-buttered baking tray and place in an oven pre-heated to 180°C and bake for about 20 to 25 minutes, or until lightly golden. Allow to cool on the tray for 10 minutes then transfer to a wire rack to cool completely. Although Richard Cook in 1835 puts his sugar and spices in with the apple pulp, we will be following the earlier (traditional) advice of Herrick in 1648 and others, and put the spices in the ale to mull first and the apple pulp in later. Preheat the oven 120C. Prepare the apples in advance: time it so they are ready when you want to put them into the lamb's wool to serve. Core the 6 apples fully, getting rid of the pips. Lightly grease the baking tray. Place the apples on the baking tray about 6cm apart - they will swell up a little. Bake the apples at 120C for about an hour or so - so they become soft and pulpy and the skins are easy to peel away. In a large thick bottomed saucepan (which is quite tall to avoid splashes when whisking) add the sugar. Cover the sugar in a small amount of the ale (or cider) and heat gently. Stirring continuously until the sugar has dissolved. Add in the ground ginger and grate in the whole of the nutmeg. Stir, and keeping the pan on a gentle simmer, slowly add in all the rest of the ale (or cider). Leave for 10 minutes on a gentle heat as you deal with the apples. Take the baked apples out of the oven to cool slightly for 10 minutes - they should now be soft and pulpy. Break open the apples and scoop out the baked flesh into a bowl, discarding the skin. Then take a fork and mash this apple pulp up, while it is still warm, into a smooth puree with no lumps. Add the apple puree into the ale (or cider) lamb's wool, mixing it in with a whisk. Let the saucepan continue to warm everything through for thirty minutes, on a very gentle heat, until ready to drink. When warmed through use the whisk again for a couple of minutes to briskly froth the drink up and mix everything together. The apple will float to the surface, and depending on how much you have whisked it, the more it looks like lamb's wool. 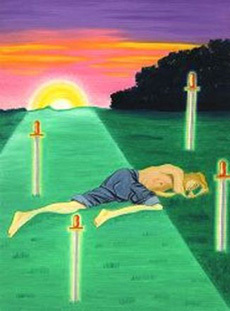 The four of swords usually appears when we have gone through a time of crisis or a battle of some description. Especially after the terrible catastrophes we have recently witnessed over the past month, energetically we must be feeling somewhat overwhelmed. This card is suggesting that we should have some time out to retreat within our inner selves for some rest and recuperation. We can do this by taking time out to meditate and rebalance our chakra system. This will give us an opportunity to nourish and revitalise our spiritual, mental and physical energies. No matter how demanding our life is at the moment we are being asked to withdraw and be still. Our higher guidance will keep events under control while we take the time to cocoon our souls. 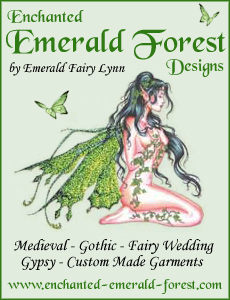 Would you like to help sponsor our free eMagazine and advertise your pagan-friendly business in Axis Mundi? 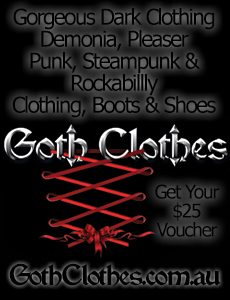 Click on the banner above for more details. Submissions to this eMagazine are open to all pagans and pagan organisations; let us showcase your work. Submit your articles, poetry, book reviews, essays and opinions, hints and tips, information pieces and artwork. All contributors whose work is included in our eMagazine receive full credit, and are linked to their website if desired.